After the Israelites conquered their enemies, only five of the twelve tribes of Israel began to take possession of the promised land. The remaining seven seemed to be in no hurry to take possession of what the Lord had given them. As Christians, we know that God's Word is true. What He has promised, He will deliver, because He is bound to honor His Word. He never fails, and He never disappoints. However, when we refuse to act on His Word and put our faith into action, like the Israelites of Old, we become reluctant to enter in and take possession of what God has already promised. We become more comfortable in our lack and complaining, than getting up and stepping into our victory. Every promise in His Word is extended to us by grace, it's up to us to appropriate those promises by putting our faith into practice. That means, when God's Word says you are healed, then thank Him for it and begin speaking and acting as you are healed. Each day determine to do something you couldn't do the day before and keep on trying, refusing to give up, until you see that healing become your reality. If you are believing for a financial breakthrough, then do what the Word says to do, each day take something you have and use it to be a blessing to others. Speak as one who is blessed and not under the burden of lack. As you joyfully give, God will bless that gift and cause it to bring increase back into your own life (Luke 6:38). 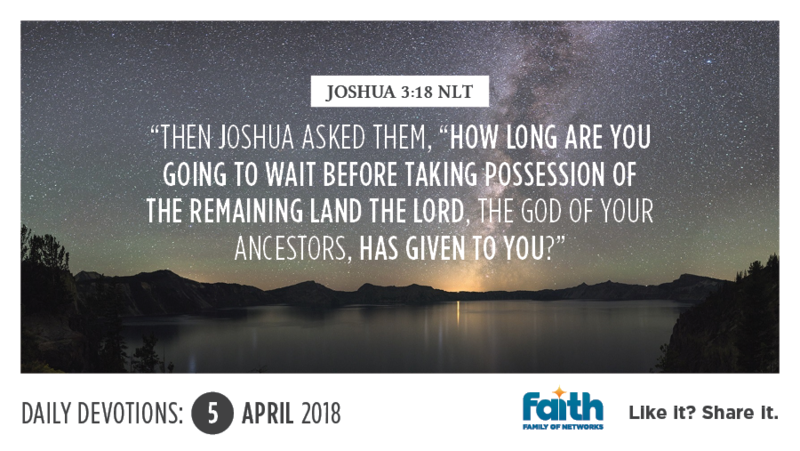 Today, don't sit around waiting for something to happen, decide to take God at His Word, act on it and by putting your persistent faith to work, this way you will take possession of what He has promised you.